EU Casino is immensely popular because its portfolio includes the favorite games of the world, which players can play in the fun as well as real money modes. The gaming environment at EU Casino is professional, but friendly; the software is the latest; and the customers are highly satisfied. 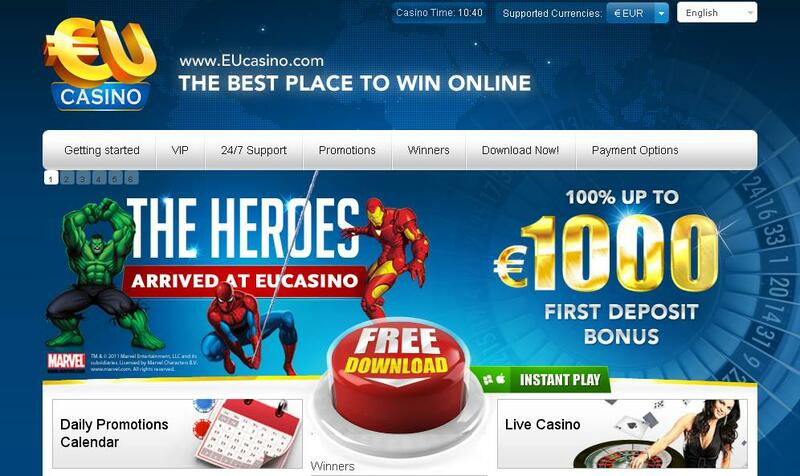 EU Casino calls its bonus welcome package of €5250 “best in the business.” The site welcomes newly registered players who make a first deposit with a cash match bonus of 100 percent up to a maximum of €1000. Players’ second deposits get a bonus of 50 percent up to €500, their third deposits get a cash match bonus of 75 percent up to €750, their fourth deposits get a cash match bonus of 100 percent up to €1500, their fifth deposits get a cash match bonus of 50 percent up to €1500, which adds up to a total of €5250. Players, however, must remember to input the bonus code 2EU1500 while claiming their welcome bonus package, as long as they make all these deposits within 2 months of registering at the site. Besides offering a generous welcome package, the online casino offers a wide range of exciting promotions which it updates on a regular basis. RealKick and Kickstart200 are two of the hottest ongoing promotions at present. RealKick gives players a free bonus of €3 on Mondays and a chance to win €200 playing selected games at the site. Kickstart200 gives players a bonus of €1 on Wednesdays and challenges them to win €200 playing selected games. Players must be careful to register for these promotions using the correct coupon code. Interested players must register a real money account at the site in order to gain access to these promotions. EU Casino supports a wide range of safe, secure, and quick payment options, of which a few are ClickandBuy, Entropay, Moneybookers, NETeller, Paysafecard, Poli, Sofort, Ukash, Visa/Mastercard, Webmoney, Western Union, and Wirecard. EU Casino is based on the brand new software gaming platform SkillOnNet, which is easy to download and automatically updates itself as soon as players log in. The online casino makes it easy for players to download the software by offering step-by-step instructions. Online casino enthusiasts can expect a rich portfolio of exciting games such as slots, blackjack, roulette, video poker, and dice games. The latest game at EU Casino is Sweets Insanity. Players stand a chance of winning huge jackpots playing these games; for instance, Millionaire Genie has a jackpot of €220,852.05. The site has a topnotch customer care system; and players in trouble can telephone +1-647-724-4691 or fax +1-760-542-6028 or email their staff. Support in different languages is not available 24/7; but queries in English receive immediate response. 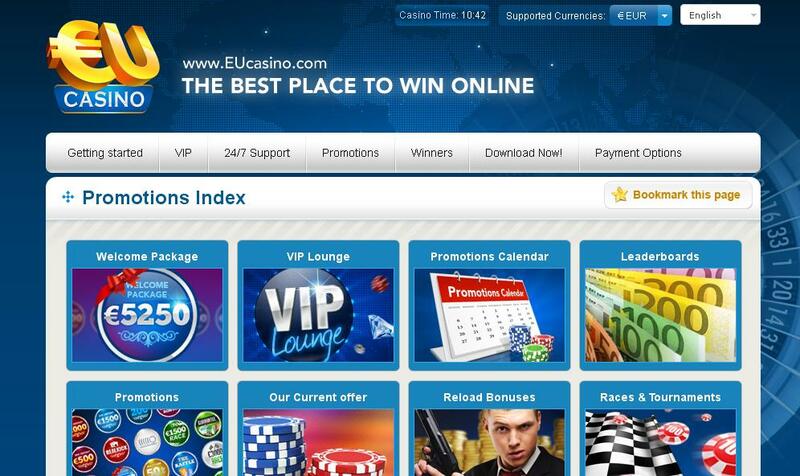 EU Casino goes out of its way to ensure that player’s financial and personal details are safe by employing topnotch security protocols such as SSL, data encryption technology, 128 bit, and others. Players are guaranteed a safe, secure, and fun gaming atmosphere.